the maize silage that was being fed on the farm. One animal was also positive for Brachyspira hyodysenteriae, and this disease agent may have also been involved in the development of bloody diarrhea. The L. monocytogenes isolates from pigs and maize silage showed an identical DNA-fingerprint assigned to sequence type (ST) 21. The plot further thickened with additional diagnostics that showed a very high content of vomitoxin or deoxynivalenol DON (3000 parts per billion) in the maize silage. monocytogenes can cause clinical disease in finishing pigs. monocytogenes is rarely seen as a clinical issue in finishing pigs. In this case you would have to be very suspicious that the high levels of vomitoxin in the face of infectious challenge from the maize silage was enough of a “tipping point” to allow clinical expression of the disease. 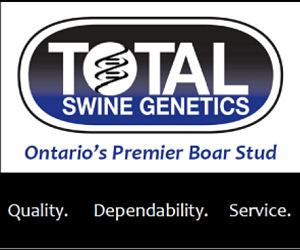 In a year with increased vomitoxin contamination of feed in Ontario any number of otherwise usually rare health issues can start to bubble up to the surface.